Born in Scotland in 1952, he studied music at York University, England and then began his musical career in the 1970s with concerts, performances and street theatre events on the experimental music and arts scene in London and around Europe. He has lived in Turin, Italy since 1982. His projects, which are often site-specific, interweaving choreographic and theatrical elements with a strong element of storytelling, range from medieval music and the traditions of the French trompe de chasse to radical improvisation. 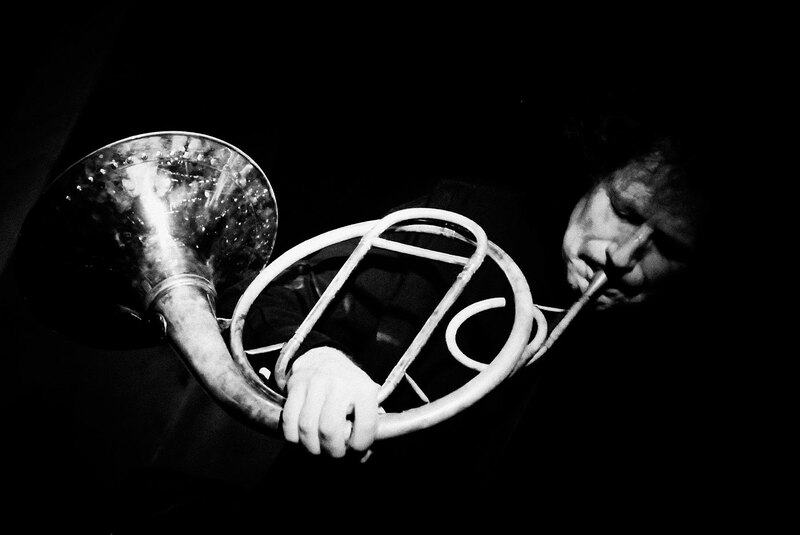 His projects include the quintet How to Shout & Blow Horns (horns and alphorns with the London-based quartet Horns Aloud); the duo PoliErranti (horn, alphorn and Italian bagpipes); the Turin-based trio Jörð (horn, bass, voice, objects & noise). His music has taken him from mountain tops to underground caves and stone quarries; from village gardens to ancient cave churches; from abandoned buildings to historic palaces. As a workshop leader he has created and conducted workshops and performance projects with all types of people of all ages, from 5-year-old children to music college students, from dancers to diabetology physicians and nurses.